Divide into two teams. Divide balls between the two goals. Keeper starts game by rolling it to attacker. Attacker goes at defender, open enough space for shot at goal. If scored or shot, GK rolls out to defending player who now attacks at blue. If defended, player must play back to keeper, open at angle and take off other wat at new defending blue player. Always remember defend first, then attack. Players switch sides after attack is over. 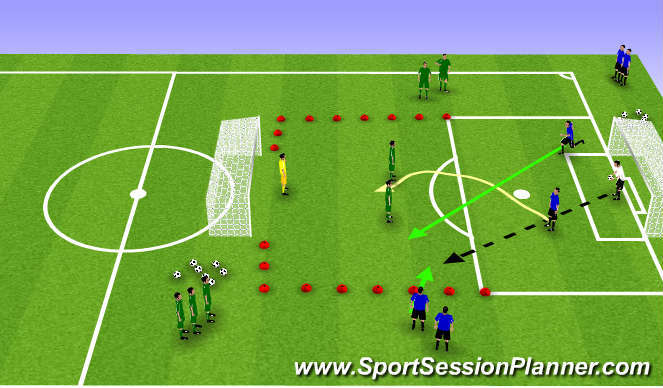 Same as last exercise, but add an attacking player to make it 2v1. Then add in another defender to make it 2v2. Encourage players to do everything at game speed, quick combinations and keep the game simple as possible. Again, add players to attack, but add them higher up the field. 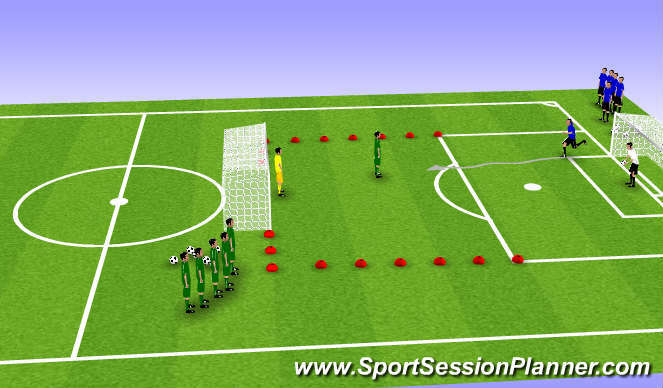 When keeper makes a save or starts the game, should look for deep ball into striker first and then the attacking players can fill the space in support of the ball. Go 3v2 and then move to 3v3. Again, game speed, limit touches, and movement should be highlights of the exercise. Players should concentrate on the finish. 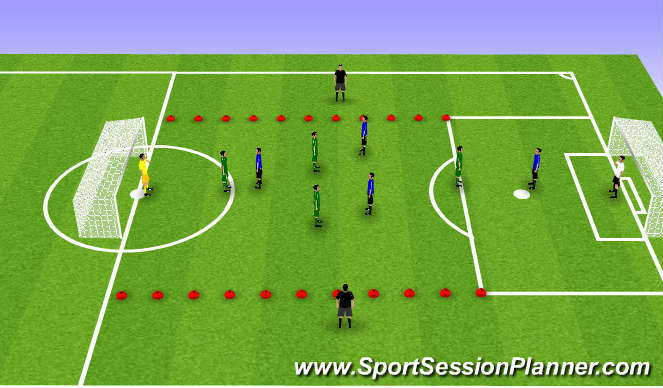 Game with wide neutrals to help retain possession and provide support in the wide areas. Look to play target player, support and penetrate off the target. Encourage two CMS to use space vacated by target player.